The problem with driving to Sedona is the scenery is so incredible, so mind-boggling, so truly unique and mesmerizing you better plan to just pull over and experience it at some point or you are going to run right off the road. We had just spent a few days in Lake Havasu, Arizona and, although we had a vague idea the scenery in Sedona would be somewhat different from what we had just experienced, we truly had no idea that the red rock canyons and soaring mountains of Sedona would be one of the most unforgettable sights in all our travels in Arizona. We managed to make it through the mountains and the town of Sedona and up to the wonderful Junipine Resort, where we had booked a two bedroom creekhouse. There are some wonderful hotels in Sedona but my advice is just to forget about them all and book a stay at Junipine. It’s absolutely the perfect place for a girlfriends getaway. With two bedrooms, a fully furnished kitchen and a large living room with a fireplace, you can really relax and enjoy your time in Sedona. All of the creekhouses have wonderful views and many have luxurious hot tubs so you may never want to leave! Stock your kitchen with snacks and drinks or even the makings of a full meal and you can really save money on your vacation. Convenient hiking trails are located right near the property and you can stroll over to the Junipine Café for a delicious, home cooked meal. 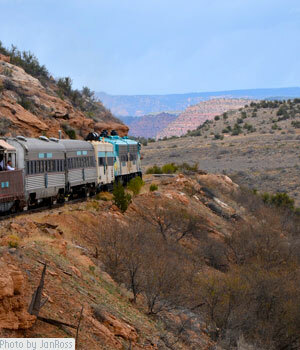 When you can tear yourself away from your fabulous surroundings, head for a day at the Verde Canyon Railroad in nearby Clarkdale, Arizona. Only about half an hour from Sedona, it’s makes for a great day trip. If you can, spring for first class tickets it’s worth the upgrade. You’ll be treated to a seriously yummy spread of free food as well as comfy, cushy seats and love seats you can spread out on as you consume all the brownies you can eat. If you are not in the first class train, don’t despair because they have really good food at the café in the depot. Whichever car you are in, there will be an adjoining, open car where you can get out in the fresh air and take lots of photos of the incredible scenery as it goes by. The trip is about four hours total, running from Clarkdale to Perkinsville and back. The train rolls through beautiful desert landscapes with soaring mountains and rivers running under the bridges the train passes over. When your train trip is over, you can spend some time visiting the area attractions, like Montezuma Castle National Monument then have dinner and an evening of entertainment at the Blazin’ M Ranch where you can have some of the best barbecued ribs you will ever eat. After dinner and a drive back to Junipine, hop in your hot tub and enjoy the gorgeous view of the mountains and the creek winding through the property. 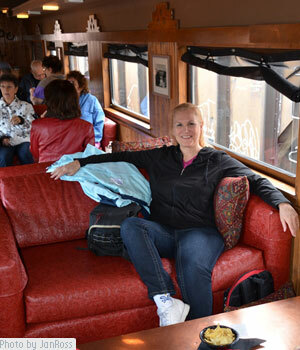 After a leisurely morning relaxing, head into town the next day for lunch at the Cowboy Club. If the weather is nice, sit out on the patio and people watch as you eat one of their signature buffalo burgers, which are delicious. Now it’s time to spend the afternoon shopping at the dozens of shops and galleries, as well as Tlaquepague Village (get a local to help you pronounce it!) where you can pick up some interesting arts and crafts to take home. Take some time to taste some Arizona wine at the Art of Wine, which features Arizona wines and wine-inspired artwork and is open for tastings seven days a week. After eating, shopping and wine-tasting, take a look back at women’s history at the Sedona Heritage Museum. Through Labor Day, the Sedona Heritage Museum will be featuring the Arizona Women’s Heritage Trail traveling exhibit, which is a celebration of women who have made significant contributions and left a lasting mark on Arizona. Now you have had a couple of days of relaxation and it’s time to really see the landscapes of Sedona. One of the best ways to do this is with an off-road jeep tour with Pink Jeep Tours. We chose the Broken Arrow Tour and had a great time. I assumed we would be up in the mountains, following some sort of trail and we wouldn’t really be off-road but I could not have been more wrong! At times, we were practically vertical as we climbed huge, rounded boulders that I didn’t believe our jeeps would climb – but they did! Even though you get to see the incredible views around Sedona, there is nothing like hiking to really see everything and Sedona has plenty of hiking trails. 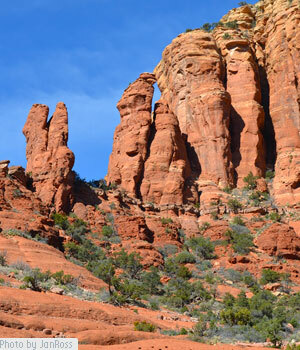 One of the most popular hiking destinations is Sedona’s majestic Red Rock State Park. A 286-acre preserve, the park also has an environmental education center and offers breathtaking views of the ubiquitous red rock and beautiful streams. Unusual local rock formations like Devil’s Bridge, which is considered the largest natural arch in the Sedona area, are great hiking destinations. The trail to Devil’s Bridge utilizes natural rocks as stairs to the top of the arch, making the trail suitable for hikers of most abilities and a great spot for memorable photos. We didn’t have nearly enough time to spend in Sedona and would have loved to check out the area spas, do more shopping, eat at some of the wonderful restaurants and hike every single trail that wends through those incredible red rock canyons. Maybe next time! We love your blog and appreciate all the details. Thank you! I was in Sedona years ago and really liked. I stayed with locals which was great as I really saw some areas I wouldn’t have otherwise. I didn’t know about the train trip. Have to try that one next. Good tip! I love the pink Jeep, and its a 4-wheel drive at that! I’ve been meaning to go for a spa getaway. But I never really thought of the hiking, too. Hmmmm … another reason to go. I just visited Sedona for the first time this year, even though I’ve lived in the Southwest for years. I absolutely loved it! Great post — you covered way more ground than I did. I need to go back! Great tips for a visit to Sedona. I’m a big fan of Montezuma Castle National Monument. On our visits, my husband and I practically had the place to ourselves. What a treat. Yes, it is truly special, I love places where you’re not elbow to elbow with other tourists. You can relax and spend as much time as you want experiencing the surroundings.